The title of Psalm 42 ascribes it to the sons of Korah, presumably a group of musicians (see 1 Chronicles 6). This is the first psalm in the Psalter ascribed to anyone other than David. Yet, the psalm seems to be set for the king in particular to sing, not only because of David’s exile from Jerusalem, but because the psalm resonates with elements we find in other psalms by David. Even the psalms that are not attributed to David or Solomon are still very much kingly psalms. This point is significant because in some ways Book Two might seem to be less kingly than Book One. Certainly, fewer psalms are attributed to David. David is the author of thirty-four psalms out of forty-one in Book One, while he is the author of eighteen psalms out of thirty-one in Book Two. In Book Two, we have seven psalms by the sons of Korah, one by Asaph, and one by Solomon. The remaining four bear no name. Yet, even the psalms that are not attributed to David either sound like David or focus on a royal theme. Psalm 45, attributed to the sons of Korah, is a good example of this latter point; it is about the wedding of the king. Another possible indication of the centrality of the king to this book is the closing statement of the book: “The prayers of David, the son of Jesse, are ended,” (Psalm 72:20). We know that other psalms of David appear later in the Psalter: one in Book Three, two in Book Four, and fifteen in Book Five. Perhaps the point here is that Book Two (or perhaps Books One and Two) belong in a special way to David, highlighting the importance of the kingship to Israel. The one psalm in Book Two that relates neither to the king nor to Jerusalem or the temple is Psalm 49. This psalm addresses the whole world and uses the kind of wisdom language often found in the book of Proverbs. It is a psalm that warns of the deceptive power of riches and reminds all that the grave is the end of all life. 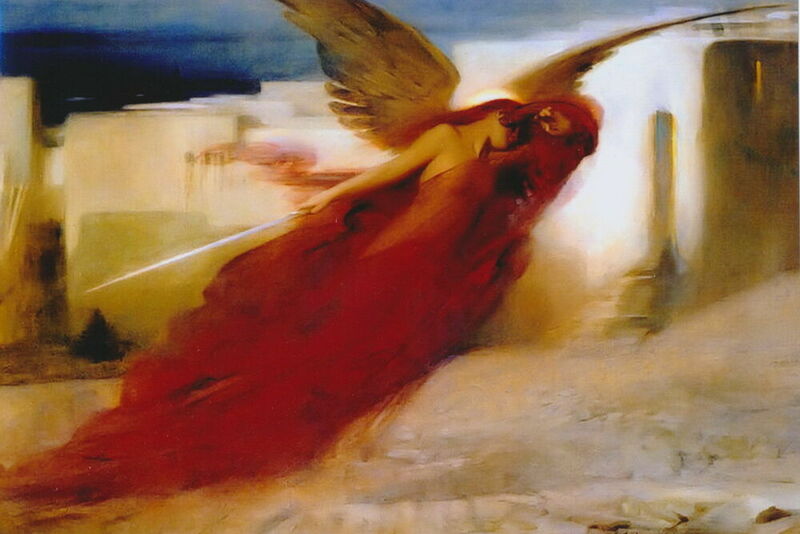 But it also holds forth the promise of life beyond the grave: “But God will ransom my life from the power of Sheol, for he will receive me,” (v. 15). Perhaps this psalm is in Book Two to indicate that Israel’s wisdom is ultimately for the whole world, just as Psalm 72 indicates that the kingdom of God will cover the world. Book Two develops the theme of kingship in several important ways. First, the psalmists confess that God is king. “You are my King, O God; ordain salvation for Jacob!” (Psalm 44:4) “For the Lord, the Most High, is to be feared, a great king over all the Earth. Sing praises to God, sing praises! Sing praises to our King, sing praises. For God is the King of all the Earth,” (Psalm 47:2, 6-7) “Your procession is seen, O God, the procession of my God, my King, into the sanctuary,” (Psalm 68:24). God’s kingship signals that Israel’s human king is not just a governor, but also a reflection of God among his people. Israel’s king is the covenant connection and representative of God with his people. As God is king, so he is the refuge, the fortress, the stronghold of his people. “For you are the God in whom I take refuge,” (Psalm 43:2). “Be merciful to me, O God, be merciful to me, for in you my soul takes refuge,” (Psalm 57:1). “O my Strength, I will watch for you, for you, O God, are my fortress,” (Psalm 59:9). “For God alone my soul waits in silence; from him comes my salvation. He only is my rock and my salvation, my refuge, to which I may continually come; you have given the command to save me, for you are my rock and my fortress,” (Psalm 71:3). God as king is the strength and preserver of his people. Second, the theme of kingship is seen in references to Israel’s Earthly king. The kings David and Solomon are in the titles of nineteen of the thirty-one psalms in this book. The Earthly king is mentioned explicitly in the body of several psalms. “My heart overflows with a pleasing theme; I address my verses for the king. You are the most handsome of the sons of men; grace is poured upon your lips,” (Psalm 45:1-2). “Prolong the life of the king; may his years endure to all generations,” (Psalm 61:6). “But the king shall rejoice in God,” (Psalm 63:11a). “Give the king your justice, O God, and your righteousness to the royal son!” (Psalm 72:1) These psalms testify to the importance of Israel’s king. The king of Israel is important preeminently because he gives visible expression to the presence and protection of the invisible God among his people. Other institutions of Israel similarly speak of God’s royal and loving care. Particularly Jerusalem, the fortress capital, and the temple, the place of meeting and mercy for the people, speak of God’s sovereign provision for his people. References to Jerusalem and the temple occur in fourteen of Book Two’s thirty-one psalms. Three examples show this usage: “There is a river whose streams make glad the city of God, the holy habitation of the Most High,” (Psalm 46:4). “Oh, that salvation for Israel would come out of Zion!” (Psalm 53:6) “God has spoken from his sanctuary,” (Psalm 60:6) God dwells among his people in Jerusalem, specifically in the temple. Book Two focuses on the king and his citadel as standing at the center of God’s great redemptive work. In his king, his city, and his temple, God was doing his saving work for all the world to see. For example, Psalm 67 prays for the priestly blessing of Number 6 to come: “May God be gracious to us and bless us and make his face to shine upon us,” (v. 1). But this blessing given to Israel is extended in this psalm to the whole world: “that your way may be known on Earth, your saving power among all nations. Let the peoples praise you, O God; let all the peoples praise you!” (vv. 2-3) The true king will ultimately have a universal kingdom. 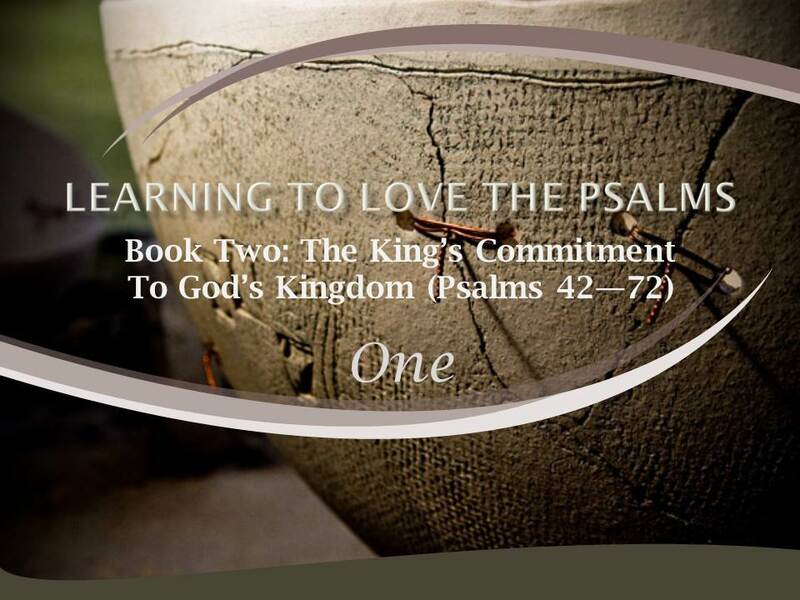 Psalms 42–44 and 69–72 express the longing of king and people for the blessings of God. Psalms 45–48 and 65–68 express the success of God and his king in Zion and in the world. Psalms 51–64, as the center of the book, expresses the struggles of David as God’s king. Psalms 49 and 50, as an artful variation of the chiastic structure, express warnings to the world and to Israel of the necessity of serving God. The vision that God’s king, capital, and temple will be a blessing to the world can only be fulfilled in Christ. The words of Psalm 72 about a worldwide kingdom are more than David or Solomon ever experienced. In Jesus, the hopes and aspirations of Book Two are being fulfilled. Provide some examples of how Book Two underscores the importance of the king and the kingdom of God’s people. What are two distinct ways that Book Two develops the theme of kingship? Why is the king of Israel preeminently important throughout Book Two? List three examples of references to Jerusalem and the temple. What is the significance of the king, his city, and his temple? How are these things applicable to Christians today?